It is day something or other – 12? I can’t figure it out right now! Ugh! The spinning has slowed but I’m hoping to catch up over the weekend. I still have a few days left to this adventure and I will get the bulk of the spinning done by cracky! Heh. Bobbins 5 and 6 which means 9&10, and 11&12, of 40! Only 28 ounces to go til all the singles are spun up. Then the plying party begins! I have been promised some intense spinning time on Sunday (I think it is) and will hopefully have quite a bit done then. 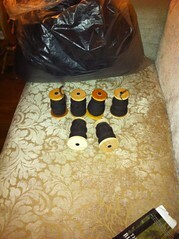 I seem to be able to put 2 ounces on the bobbin an hour. Which isn’t too shabby, I think.